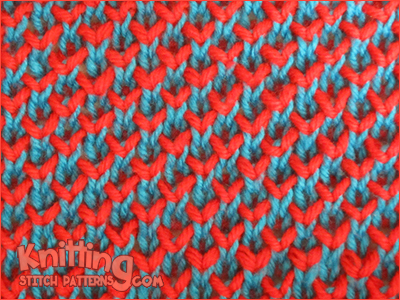 With color A, cast on loosely an even number of sts and knit one row. Row 1 (WS): With color B, k2, * yf sl1yo, k1; repeat from * to end. Do not turn, slide sts back to opposite end of needle. Row 3 (RS): With color B, p2, * sl1yof, p1; repeat from * to end. Do not turn, slide sts back to opposite end of needle.